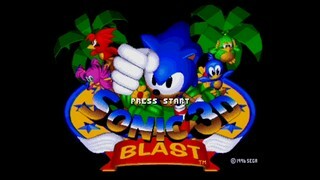 Sonic 3D Blast on thje Genesis is an isometric platformer and the famous hedgehog's first dabble with a 3rd dimension and the player's first encounter with the frustration of landing right behind a spring. 100% means obtaining all chaos emeralds for the best ending. Best 100% time: Single-segment 0:41:23 by Matthew 'voideddarkness' Millwood on 2014-01-24. Hey there, my name is Matt, I usually just go by Void around the internet, and this is Sonic 3D Blast Good Ending speedrun. -Nightdawnletsplay (Nightdatsu) for always cheering me on when my runs would start going terrible. -Ikumi-chan for also supporting me through my many attempts and motivation during some of my less than ideal issues offline. -Master of Pigs for his TAS video that I found that had given me some route ideas for flicky gathering. -GTNTG for giving me some hard competition in driving me to play this game better. Now before jumping into the individual level comments, there are a few tricks that help make optimizing certain tricks and making them as routine as possible to ensure easier repetition and consistency pulling them off throughout all my attempts at this game that I want to point out and clarify. -Jump storage: The game is programmed that you can actually hold the jump button while you are in a falling animation to essentially store a jump for use on the frame that you touch ground. Normal jump storage cannot be done while having a golden (homing) shield as it'll stop all momentum forward and slam you to the ground, however when in an "unnatural" falling animation, such as from a spring or after homing into an enemy, you can use it since the homing flag is not triggered while in those statuses. -Momentum killers/boosters: Using certain slopes throughout the game can help you gain momentum to move from one side to another faster, while some can be used to slow your momentum down to better line up proper, or even launch you higher in the air. -Ring avoidance in bonus stages: The bonus screen at the end only ends once it's done processing all the points and triggering certain flags for how the rest of the game goes. While you have a huge window of rings you can get before it actually becomes a noticeable time loss, it's still better practice to just get by with as few rings as needed. -Spindash panels: These things only being seen in Volcano Valley stages are meant to have you spin ontop of them all the way to the very top before letting go to roll onto the higher part of the stage, but it's possible if you start far back on the platform and jump into the wall, you can cancel all horizontal movement while keeping the vertical height to jump up onto the next part of the stage sooner. Green Grove 2-Tails (Costs 10 seconds of going out of the way to reach him. Green Grove 1: This one wasn't my best start as I had made a lot of tiny mistakes throughout it, but overall was still within my acceptable range and I was tired of resetting at the time. Green Grove 2: Other than the slow ring gathering for the 2nd emerald, this one went over really well, managing to kill the three worms very fast. Green Grove 3: Got close to perfect boss manipulation here, so it's about as good as I could have hoped for. Rusty Ruins 1: My most hated set of levels in the game, all three of them, and it shows in this run. So many minor issues here and there, still sadly an improvement from my last attempt, but can be improved more by ~3 second. Rusty Ruins 2: Had some more major issues with enemy killing/movement that I wish I could have done better, costing around ~5 seconds. Rusty Ruins 3: Got the damage boost first try and in game timer counted to 11 seconds. As good as it'll get in a run. Spring Stadium 1: My first major improvement from last time, managed to gather the rings decently paced and I gained some time in the later half of the stage to make up for the lackluster Rusty Ruins. Spring Stadium 2: Significant time gain through better optimized ring gathering path as well as a strong finish for the level. Still wonder how that pufferfish bot managed to not die while I had invincibility going through it, but it didn't cost too much time luckily. Spring Stadium 3: Got the quick hit on him and managed to manipulate the rest of the fight decently on the spot. I missed a lot of my jumps so some time could have been saved rather than lost, probably ~2-3 seconds. Diamond Dust 1: Managed to get through fast with all my rings in tact so I was happy with that, but then again I had a perfect run through in my last pb so I lost time overall, about 2 seconds slower in the later half. Diamond Dust 2: Terrible ring collection on this one, had to go back to get a single ring I could have sworn I heard myself getting but overall didn't lose too much time. Diamond Dust 3: One of the more laid back bosses, you still have to hit him as soon as it's possible, but you get huge windows of downtime between attempts so this boss is one of the only rest times in the run between hits. Volcano Valley 1: Managed to get the rings rather smoothly and grabbed the fire shield straight out of the floor tube. The rest of the level went decently well, got all the dash panel jumps without issues. Volcano Valley 3: Got as quick a kill that I can ever get on this guy. Gene Gadget 1: Got really lucky with some of the enemy kills and flicky gathering, so this one was a major improvement. Gene Gadget 2: Was a little slow as to not mess up on the giant slope in the first area and kill the run, so some time was lost. Gene Gadget 3: This boss is not only the toughest, at least for me, but the most forgiving. As long as you attack him while he is going down you can get hit by anything without being penalized too harshly for time. Panic Puppet 1: Another major time gain for me, managed to grab the flickies pretty fast as well as not lose them to trolling sniper spider robots, specifically the one before the teleporter elevator to get to the section that has the end ring. Panic Puppet 2: This one is pure speedrun material, as there is nothing to gather. Risky strats for this level would involve jumping behind the elevator platform floating above the steep slope to get on it faster, which saves roughly 7 seconds compared to just waiting on the platform, but if you fall off you have to wait for the first elevator to go all the way down and back up to get another try at it, and this being the 3rd from last section of the game, it was a risk I wasn't going to take with the run I was on at the time. IF time was needing to be made up or it was a TAS it'd be unacceptable to not go for it. Panic Puppet 3: I got really lucky with the response time from the first form of the boss, only really lost time on the second phase with jumping into the flamethrower, but other than that a really solid boss. Final Boss: The grand boss of the game, as with GG3 boss it's rather forgiving if you get hit, unless its right when he's making himself vulnerable and you miss the hit window. Then you have to sit through his attack all over again before having another attempt. Luckily this didn't happen to me. And that's it, hope you guys enjoy!